This subsection is meant for creating an additional user. These are the required fields. “First name” – provide the user’s first name. “Last name” – provide the user’s last name. “Email” – provide the additional user’s email that will serve as a login. “Password” is a required field. Enter here the password of the additional account. “Confirmation” is a required field. Confirm here the password of the additional account. “Generate password” – this is an option allowing you to automatically generate the password and send it to the additional user by email. When selected, the “Password” and “Confirmation” fields become inactive. “Access owner” – selecting this checkbox, a user will have access to all the account-related campaigns under the rights granted by the administrator of the given user’s role. 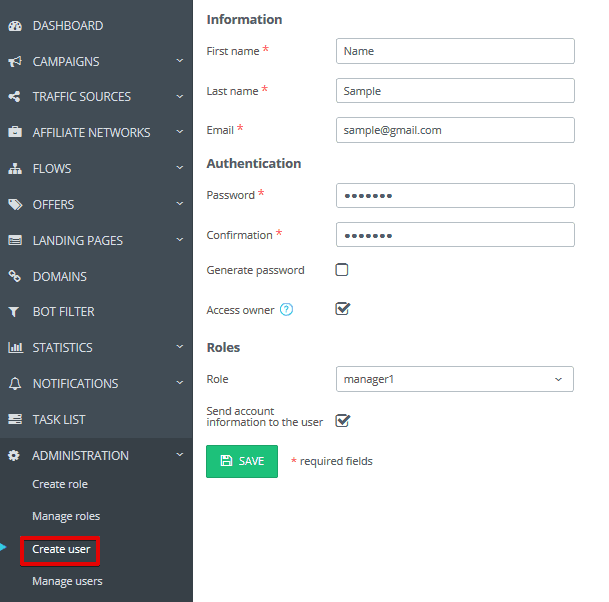 Please note that all the campaigns created by a user with the active “Access owner” option will be related to the administrator’s main account. In case the “Access owner” checkbox is not filled, the additional user will be able to view and create campaigns only in their account and won’t have access to the rest of the campaigns. “Role” – you can select the already created role in this drop-down list. “Send account information to the user” – after you’re done with the user settings, you can automatically send this account information to a user’s email (login and password).